(ARA) – Grilling over the open campfire is a rich tradition. Maybe it’s a combination of how the wood brings out food’s natural flavor and the ambiance of being outdoors. Whether camping with the family, hunting with friends or simply achieving that wood-grilled flavor at home, campfire cooking is delicious and easier than you might think. This first thing to keep in mind is that cooking over a fire is different than using a traditional stove. Make sure to pack forks and knives as needed along with kitchen supplies such as tinfoil and resealable plastic baggies. It’s also a good idea to bring extra butter and oil, along with salt and pepper as these can be used for cooking most items. Planning out your meals will save you time and money when it comes to camping. Depending on the type of tools you have for cooking over a fire, you can cook simple items like hotdogs or complex items like pizza. So what is the best way to cook over a campfire or fire pit? Metal pokers might work for marshmallows, but are very limited when it comes to cooking a whole meal. Tripods are convenient, but they can get messy and are unstable. 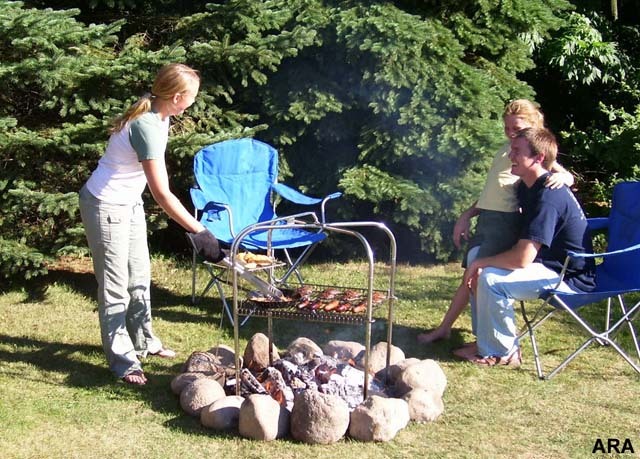 Use a grill made especially for this type of use such as the Quad Pod, a collapsible metal grill that can be placed over a fire for cooking many types of food. Four metal legs keep it stable and the adjustable grate was designed to provide the user with complete control of cooking temperatures. The side table allows you to keep side items, such as a kettle of coffee or ears of corn warm while you cook other food. Take a 12-inch piece of tinfoil and lay on the table. Place potatoes, carrots, onion and the camper’s choice of meat on the tinfoil. Add a small amount of butter or oil to help the ingredients cook and prevent sticking to the foil. Cover with another piece of tinfoil and wrap into a small package. Place foil on the grill, flipping every ten minutes. Check progress after 20 minutes to see if meat and vegetables are thoroughly cooked. Mix pizza crust mix as directed on package. Pat out dough to 12-inch circle and place on grill. Add remaining ingredients. Cover top of pizza with a large piece of tinfoil. Bake until base is golden and insides are cooked. Allow extra time for thicker crusts. After you’ve cooked all your food don’t delay in cleaning up. Now with a full stomach you can truly sit back and enjoy nature. Who knows, you might have so much fun cooking over your campfire that you want to do it at home! Use your grill over the bonfire pit at home to get the flavor of the outdoors any time of year. Ask for the Quad Pod by Grate Mate Outdoors by name at your local outdoor retail store. For more information visit www.gratemateoutdoors.com.